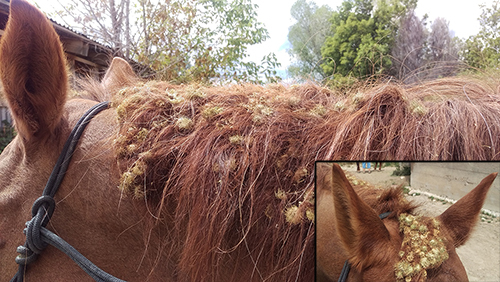 As I’m working to clean the burrs out of Karmel’s mane I’m feeling very smart and Zen like because I’m thinking I’m so connected to the process. “Where am I?” I think to myself, “I’m here. Now.” I’m feeling pretty satisfied with myself. Karmel suddenly stomps his left front hoof on the ground and then puts his nose to his hoof. Maybe 30 seconds later another stomp and the nose… again I shrug it off, “random fly”. He does it again and I only half notice because my mind is babbling along again about how meditative this activity is and how present I feel. Suddenly a big horse head bumps into me and I take a half step back. My mind stops… then one word “Ground”! It’s as if Karmel actually spoke it to me even though I know it was merely me becoming present for the first time all day. After the head bump I’m awake and present. Finally, REALLY present. I realize he’s been letting me know that I’ve been in my head and not at all with him this whole time. I take a deep breath and start to ground. I feel my feet firmly on the ground next to his big, beautiful hooves. I note there’s a lot of weight in my toes, tension in my quads pulling on my kneecaps, my hips pushed forward and my hands feverishly working on his mane as if getting him clean were a race. I stop, take another deep breath and correct my body alignment; moving my weight to my heels, relaxing my quads, and overall becoming aware from the tips of my toes to the top of my head. Karmel takes a big deep breath, rolling his nose as he exhales (If you can imagine a big inhale followed by a low cat purr sound, that’s what he did). I follow his lead and take a deep refreshing breath (without the purring) and become instantly present with him. 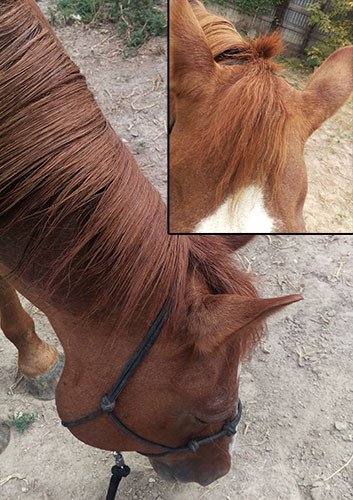 I slow my pace as I remove the burrs from his mane. Every now and again my horse teacher takes a big deep breath and I follow suit. The thoughts, I didn’t even realize were taking over, subside. Karmel is noticing my energy, as my mind wanders, and he keeps redirecting my attention over and over. What a kind, patient teacher. And then I’m done. He’s clean. And we are here. Now. At least for a moment.